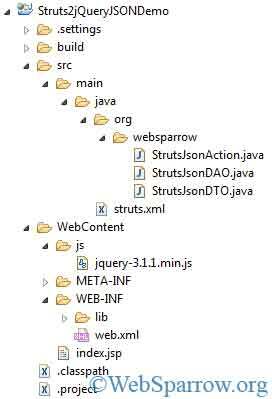 In this Struts 2 tutorials, we are going to integrate the jQuery JSON to fetch the data without page refresh. To do this jQuery provide the predefined method $.getJSON(). This method similarly works as $.ajax() method provide in jQuery. In this example when we select the Country name it will internally fetch the State list related to the selected country. Note: The response to be sent to jQuery is of type JSON, to handle it you need struts2-json-plugin-2.x.x.jar. Step 1: Create the table and insert data into the table. Step 3: Create the class for DB connection and DAO. Step 4: Define the entity of table in DTO class. Step 5: Create the Action class. Step 7: Design the front end page for the user. Finally, everything is set. Now run the application and click on the Click Me button. It will fetch the all country list form the database, and when you select any country it will fetch the state list of that country. You will notice the page is not refreshing.